Much of the work currently conducted within the framework of Universal Grammar and language learnability focuses on the acquisition of syntax. However, the learnability issues are just as applicable to the domain of phonology. This volume is the first to gather research that assumes a sophisticated phonological framework and considers the implications of this framework for language acquisition -- both first and second. As such, this book truly deals with phonological acquisition rather than phonetic acquisition. Contents: Preface. J. Archibald, Introduction: Phonological Competence. B.E. Dresher, H. van der Hulst, Global Determinacy and Learnability in Phonology. K. Rice, P. Avery, Variability in a Deterministic Model of Language Acquisition: A Theory of Segmental Elaboration. E.J. Fee, Segments and Syllables in Early Language Acquisition. D. Ingram, The Acquisition of Negative Constraints, the OCP and Underspecified Representations. J. Archibald, The Acquisition of Stress. K. Demuth, The Acquisition of Tonal Systems. D.A. Dinnsen, S.B. Chin, On the Naural Domain of Phonological Disorders. E. Broselow, H-B. Park, Mora Conservation in Second Language Prosody. T. Scovel, Differentiation, Recognition and Identification in the Discrimination of Foreign Accents. 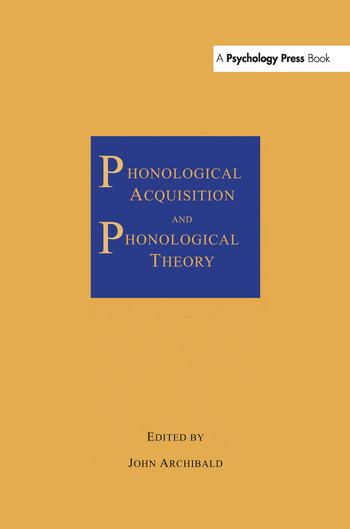 "...provides valuable insights into the relationships between data and theory in the acquisition of phonology by children and adults....individual chapters are written by top scholars with different backgrounds, interests and theoretical perspectives."